We work with you to establish your targeted commercial goals and preferred outcomes for the Learning Journey. Frequent reviews, modelling, trialing, testing and prototyping confirm the direction of travel. Curiousity is the driver. We create opportunities and processes for exploring areas of interest en route and adopt LEAN and AGILE approaches. We work with imagination; exploring the impossible. Nothing is off the table. Our process is rigorous. We prototype and test: weigh costs and benefits: inbuild viability and feasibility and kickstart action with pilot projects. ‘Chris facilitates a process that has enabled us to develop an experiential learning programme tailored to the needs of our stakeholders. Drawing on a depth of knowledge and experience, Chris listens carefully to what we know of our specific context and helps us to shape the design accordingly – taking us from a blank sheet of paper through to the end goal’. Under the auspices of the European Research Council, the 'GlobaldiverCities' project was established to create new knowledge surrounding changing patterns of migration in cities around the world. It's goal was to generate comparative analyses in multiple formats (a book, films, academic articles, data visualisation, photo exhibitions and an interactive online platform). Learning Journeys provided a range of services for coordinating and managing remotely-based members of an international team, enabling the effective realisation of project aspirations. Major Global Petrochemical Company – ‘Choices’ - Culture Transformation – Changing how we do business. The Innovation Journey: Development of ground-breaking company-wide Core Values. Collaborating with Dr. Andy Goodman, Director of Arloesi Pontio Innovation and leading Bangor University Academics - Behaviour Change, Engineering, Product Design, Business, and Media to design and facilitate a 12 week experiential learning programme for 60 undergraduate students in multidisciplinary teams of 5 plus a post-graduate facilitator. For teams to work with a real customer to develop a new product, service or business model. Participants undertake a learning journey to include: product/ service design, consumer psychology, engineering and manufacture, prototyping, marketing, promotion, business planning, presentation and pitching, leadership and project management. 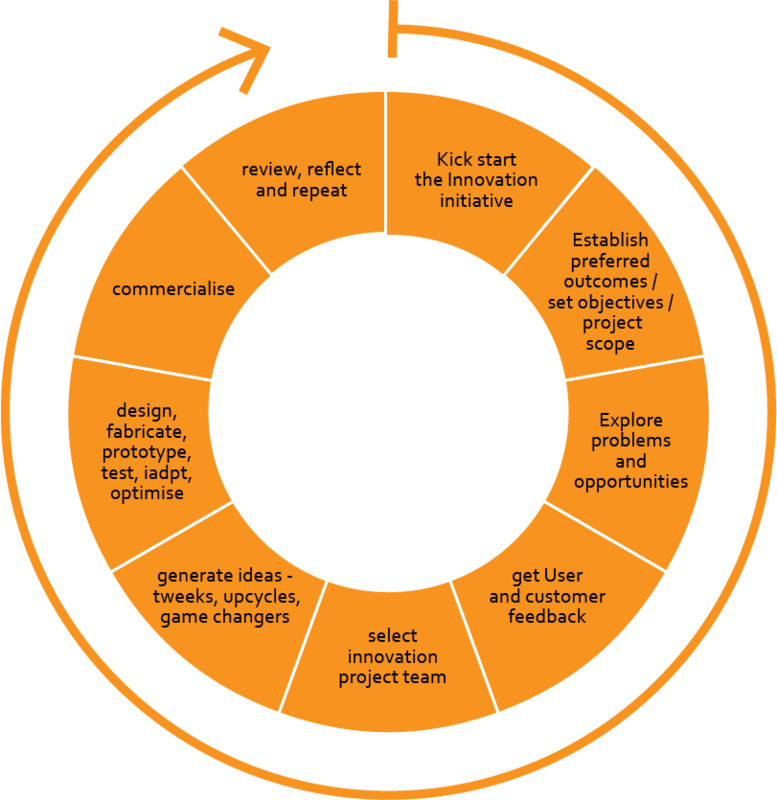 The Innovation Journey – steps to identify customer problems and opportunities and developing commercial solutions that add value to their customer.